It’s been almost two decades since a new nuclear plant opened for business in the United States. But that’s about to change as construction wraps up on the Tennessee Valley Authority’s Watts Bar Unit 2 (WB2) plant. Completion of the plant’s construction, following a long hiatus, confirms the importance of nuclear power in the overall energy supply in the US and beyond. To some, its opening later this year heralds the beginning of a much-anticipated nuclear renaissance in the US. It’s been a long and winding road for WB2. The project started in 1972 and was suspended in 1988 when the growth in power demand began to decline for TVA. 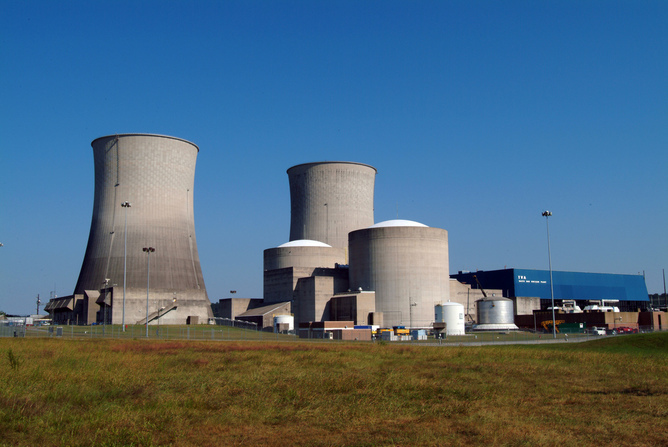 Its sister unit, Watts Bar Unit 1, went on to open in May 1996, and was the last nuclear plant to do so in the United States. Work resumed in 2007 on WB2. TVA says total construction investment to complete construction of the plant is in the range of US$4 to $4.5 billion, with commercial operation anticipated for late 2015 or early 2016. When operational, WB2 will add more than 1,100 megawatts of generating capacity to the TVA system – enough to power 650,000 homes. Engineers started drawing up the plans for these two Tennessee reactors in the 1960s, so critics have said that Watts Bar 2 isn’t so much the first nuclear power plant of the 21st century but instead the last one of the 20th century. But it has successfully passed a number of pre-operational tests of key systems and confirmed that all equipment and facilities ordered or built 40 years ago have been properly refurbished and updated. WB2 meets the latest safety standards, including those instituted after the 2011 Fukushima disaster in Japan. One example is the steel reactor vessel with nine-inch-thick walls that can withstand a system pressure of 2,250 pounds per square inch. It serves as an important barrier for any radioactive material produced in the reactor core during the operation of the plant. In a nuclear power plant, rods of uranium fuel are submerged in a pool of water. Fission chain reactions in the nuclear fuel generate heat and, by circulating water through the reactor core, the power plant produces steam that turns a turbine to generate electricity. Water is continuously pumped through the reactor core to remove the heat and avoid overheating that could cause problems. The WB2 plant uses a well-established pressurized water reactor design that forms the basis for approximately two-thirds of the 100 nuclear plants, which generate about 20% of the nation’s electricity. The design, construction, and operation of the plants rely on the principle of having multiple safety barriers, which is called defense in depth in the industry. A key safety feature of the plants is that the fission rates – or the rate of uranium chain reactions that create heat – will slow down if the cooling water temperature gets too high. That will reduce the power output and avoid overheating. The 2011 Fukushima accident taught a valuable lesson when massive tsunami waves damaged four nuclear plants. In response, the Nuclear Regulatory Commission mandated new safety rules to lower the risk from this type of threat. Plants now have sheltered facilities where emergency equipment including power sources, pumps, hoses and communication devices are stored. The Watts Bar site features 16-foot tall, 18-inch thick tornado-proof doors. The site is also served by one of two response centers at nearby Memphis, Tennessee, where five sets of portable emergency equipment are maintained. The ice condenser containment building at Watts Bar 2 has come in for some criticism because it has a smaller volume than those at most other pressurized water reactors. It features beds of ice that could quench steam generated in major accidents and thus protect the reactor core and the containment building, the structure that encloses the reactor vessel and the core to prevent the escape of radiation in an emergency. Eight other pressurized water plants in the US, including the Watts Bar Unit 1 and Sequoyah Unit 1, which is also in Tennessee, have similar ice condenser containments. In studies analyzing the risk associated with nuclear plants, the overall risk of operating the Sequoyah plant is estimated to be comparable to nuclear plants without ice water containment. The world needs affordable, clean energy and entrepreneurs are working on figuring out new ways to generate it. Natural gas could be an inexpensive source of energy in the near term, but fracking technique used to extract it may pose substantial geological concerns and releases methane, a potent greenhouse gas. Furthermore, combustion of natural gas produces a significant amount of greenhouse gases. The Watts Bar 2 nuclear plant will use the Westinghouse AP1000 design, which is being used in other countries including China. Even Bill Gates has established a company to develop and eventually build a so-called breeder reactor. This new type of nuclear reactor could operate with recycled used nuclear fuel and uranium tailings left over from enrichment plants. Breeder technology would help solve the problems associated with disposal of used nuclear fuel and at the same time produce affordable clean energy for the foreseeable future. As the WB2 plant in 2015 and four other plants with the AP1000 nuclear power plant design prepare to go online over the next few years, nuclear deserves to take a prominent role as a carbon-free source of energy in the US.